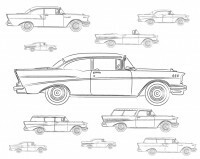 1957 Chevrolet models featured a substantial redesign, sharing only the roof, doors and trunk with the previous years. The bumper and grille were integrated and a new gauge cluster was introduced. These models were the first to focus heavily on sportiness. In 1957, four V8 small block engines were available, including the “Corvette” V8 which was offered in both dual-four-barrel carbureted or Ramjet fuel injected configurations – the latter making 250 horsepower. 1957 was the final year for this body styling; in 1958, the Impala would top the model line.